I have never much cared for anthology films, primarily because the short film is a difficult medium. Short films require the audiences to care with a fraction of typical cinematic running-times, and these movies tend to be little more than a collection of shorts. Somehow Wild Tales manages to escape the usual pitfalls, whether it is in the successful thematic connections between the six narratives or simply because of how engagingly well-made each of them are as individual segments. This one of the few instances of viewing an anthology that I was engaged enough by the individual segments that I did not find myself waiting for the next to begin, or counting how many remained before the end of the film. Even with a 2-hour running-time, Wild Tales has little fat that needs trimming, moving along with perfect pacing delivered through precise editing. The film begins with a series of coincidences between a model (Maria Marull) and a music critic (Dario Grandinetti) aboard an airplane, ending in a darkly comedic twist that feels lifted from an early Coen brothers’ film. This tone is carried through to the rest of the stories, often resulting in death that is simultaneously tragic and hilarious. A young waitress (Julieta Zylberberg) is faced with the dilemma of revenge when a man (Cesar Bordon) from her past enters the diner she works in, road rage between two men (Leonardo Sbaraglia, Walter Donado) from different social standings spirals out of control, a demolition engineer (Ricardo Darin) struggles to fight the injustice of the city’s parking enforcement procedures, a father (Oscar Martinez) uses his wealth to bribe his son out of a hit-and-run accident, and the final segment involves a bride (Erica Rivas) discovering the infidelity of her groom (Diego Gentile) during their wedding reception. Little more should be described about each section of the film, as the element of surprise is where a great deal of the film’s pleasure is derived. At the same time, this is a technically accomplished movie that deserves repeat viewings. Although this is Argentinean filmmaker Damian Szifrón’s first feature since 2005, I imagine we will be seeing more from him in the near future. 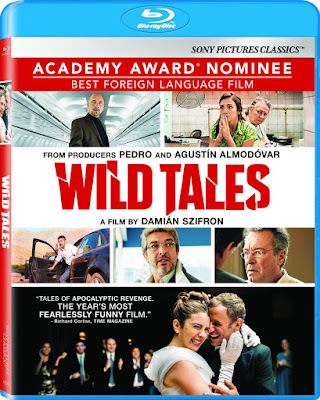 As well as writing and directing Wild Tales, Szifrón also co-edited the film which was co-produced by Pedro and Agustín Almodóvar. Completing the technical proficiency of the film is the polished cinematography done by Javier Juliá. The Blu-ray release of this Best Foreign Film nominee from this past year’s Academy Awards includes a making-of featurette, as well as footage from the Toronto Film Festival screening. This may not be much, but the high definition format of the film is enough to make the Blu-ray desirable for presentation.